What should I make for dinner? This daily lament is the billion dollar question fueling a booming meal kit industry. Weekly deliveries of fresh ingredients with easy-to-follow recipes offer the promise of an easy weeknight dinner. However, a growing segment of this audience such as young professionals and busy families is seeking something even simpler, less time consuming, and healthier. Meet Zoni Foods. Founded by Zoë Lloyd and Nilofer Ahmed while students at Yale, Zoni Foods aims to make it easy for everyone to eat healthy meals quickly. 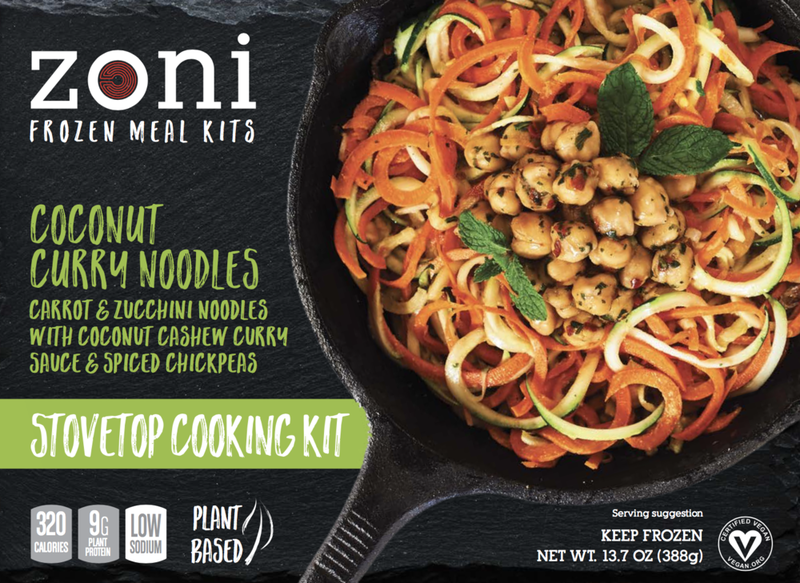 Each of their plant-based frozen meal kits features three natural and low-sodium components: a starch, a plant-based protein, and a sauce. Three meals are currently available locally; Zesty Peanut Noodles with soba noodles, black bean fritters and peanut cilantro sauce, Coconut Curry Noodles, a combination of carrot and zucchini noodles with chickpeas in a coconut cashew curry sauce, Zoni’s vegan take on mac and cheese—sweet potato noodles with a cashew cream sauce and lentil kale fritters. Separately frozen in individual packets, each meal kit takes less than ten minutes to cook on the stovetop without calling for any additional ingredients or expertise. Zoë and Nilofer met at Yale while pursuing their MBAs at the Yale School of Management. As busy students they found it difficult to find quick healthy meal options. They turned this challenge, blended with a mindfulness of human health and environment, into a business drawing upon a network of entrepreneurial support from across Yale to refine their initial idea, incorporating the business in 2016. Zoni Foods is now available at 13 natural food stores and small grocery stores across Connecticut, with plans to expand regionally soon. I recently chatted with Zoë Lloyd, the CEO and co-founder of Zoni Foods who shared her experiences as a Connecticut-based food entrepreneur and the inspiration behind the nutrient-dense and tasty meals. In graduate school, I often felt like I didn’t have enough time to cook good, healthy food - this became frustrating as the semesters continued. I found that many of my fellow classmates shared this same frustration. It was hard to find a time to shop, let alone cook and clean up. So my Co-Founder, Nilofer Ahmed, and I set out to make it easier for busy people like us to prepare a healthy meal they can feel good about. So we designed a prepped frozen meal kit in order to significantly reduce the time spent prepping, cooking, and cleaning up. We decided on a frozen meal kit not only due to the convenience frozen foods provide, but because it helps consumers reduce food waste—a hundred billion dollar problem. And lastly, we really saw a lack of innovation in the frozen food aisle and therefore an opportunity to reinvent it. We are committed to making plant-based eating accessible because we believe eating real plant-based foods can improve our own health and the health of the environment. I’ve realized that the average American eats an incredible amount of meat and processed foods, which are one of the main drivers of heart disease and a number of other maladies. By making plant-based foods tasty and easy to prepare, we have the opportunity to bridge the healthy eating gap while simultaneously mitigating the harmful impacts animal agriculture has on the environment. Coconut curry, zesty peanut, and sweet potato spirals. What inspired these flavor profiles? We started in my own kitchen experimenting with carrot, zucchini, and butternut noodles with our $30 spiralizer machine. Nilofer is from Canada and pointed out that zoodles are very trendy, but a lot of work so maybe that could be a good base for our meal kits. We also found inspiration from a few food bloggers and one of Nilofer’s mom’s lentil recipes. Our current meal kit varieties are very “flavor-forward, which was what we personally liked and turns out what lots of millennials are looking for. We didn’t want to design recipes that sounded trendy just to appeal to consumers, but we wanted to design a product that first-off tasted delicious and secondly contained natural, plant-based ingredients. We feel like we have achieved both - a sweet spot in between taste and health. Where do you manufacture? What does each kit cost? Zoni’s meal kits are manufactured at the eastern Massachusetts Food Processing Center in Greenfield, MA Zoni produces and sells three kits to 13 Connecticut stores.Our meal kits sell for between $5.49-$6.69 in retail stores. Tell me about your experience launching a company while a student at Yale. Being at Yale was the best time to start a business because you are directly applying what you are learning in classes and workshops. Starting a business while in grad school, you have so much support—having the support of the community of fellow entrepreneurs, students, and staff was incredibly helpful during the early stages. Yale has been incredibly supportive in the development of our idea as well as getting our business off the ground in the first year. Not only via financial support through the Yale Entrepreneurial Initiative, Yale SOM, and Yale FES but also via access to amazing mentors that have experience in food and/or entrepreneurship. Our team of advisors, including SOM staff, faculty, and alumni have been invaluable in helping develop the product, set up the business, and plan for growth. Throughout my second and third year, the Yale Center for Business and the Environment and Yale SOM provided a number of different opportunities to pitch our business including the Sabin Prize and others. These were not only great learning experiences but really fun too. Not only did we start Zoni to make it easy to eat plant-based foods, but we also have a greater vision of improving human health and the health of the environment. That is what really drives me every day. And when the challenges and odds seem stacked against us, seeing people say “that is the bomb” after tasting one of our meals and then going to buy it is honestly what keeps me going. What were some of your biggest challenges you’ve faced launching a product? Timing of our go-to-market strategy and production. The main challenge continues to be figuring out the operational plan and equipment we need to scale in order to reduce our per unit costs and get our meal kits into more stores and online channels. Also, there is an opportunity to sell to a variety of different stores and online channels, but the question is - What is the best time and who is the best partner? There are so many opportunities, but we need to focus on a short-term strategy and execute on that.